I had been wanting to go out on another camping trip. But we are in the middle of the summer doldrums, where it's too hot to do anything outside (temperatures in the 100s will do that to you). On top of that, we are in the middle of a horrible drought. 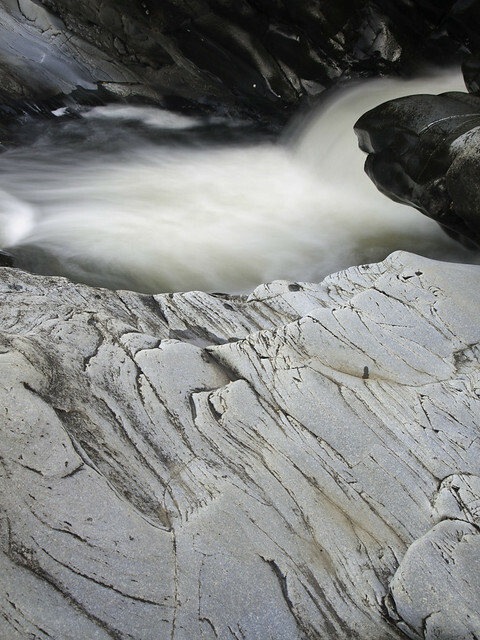 Sadly, all of the rivers and streams have just about all dried up. It was getting dark, so our focus turned to finding a place to get a good view of the sunset. But by the time we found a spot it was too late, the light was quickly fading away. 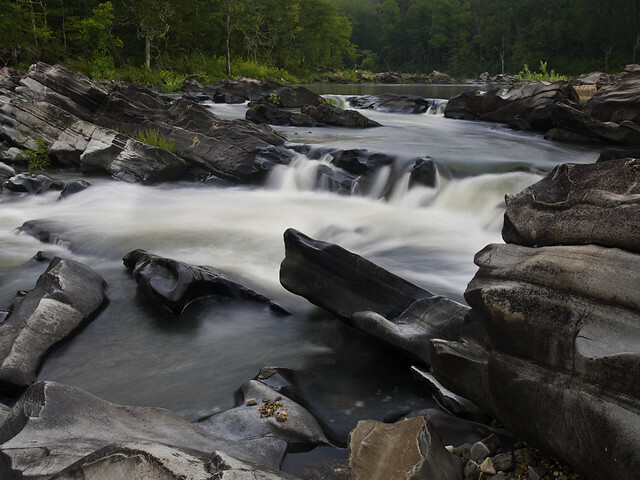 So we headed on to Cossatot River State Park, and set up camp near Cossatot Falls. For being so hot during the day, it actually cooled off nicely at night (although still very humid). The only bad thing was that due to the burn ban, we couldn't have a campfire. The alarm clock went off at the painfully early time of 5:45 am (on a Saturday, ugh I don't even get up that early to go to work). But we wanted as much time as possible at the falls before the sun came up and ruined the light. So I sleepily took down my tent, and made my way to the river. 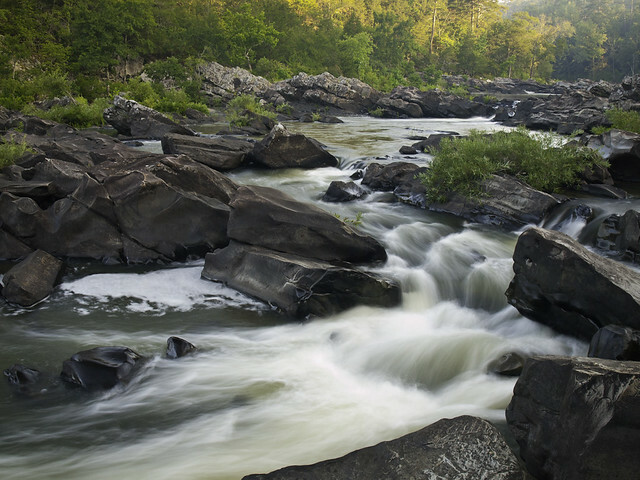 The Cossatot River flows for about 26 miles through the Ouachita Mountains in the western part of the state. 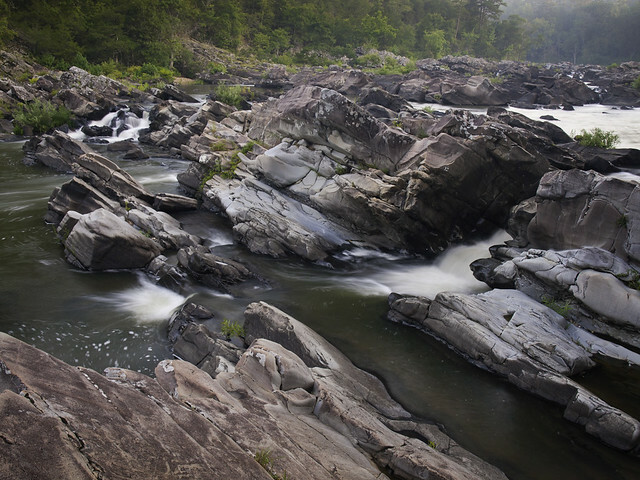 It is a popular spot for kayakers, and has been called the "most difficult whitewater stream in the state of Arkansas." 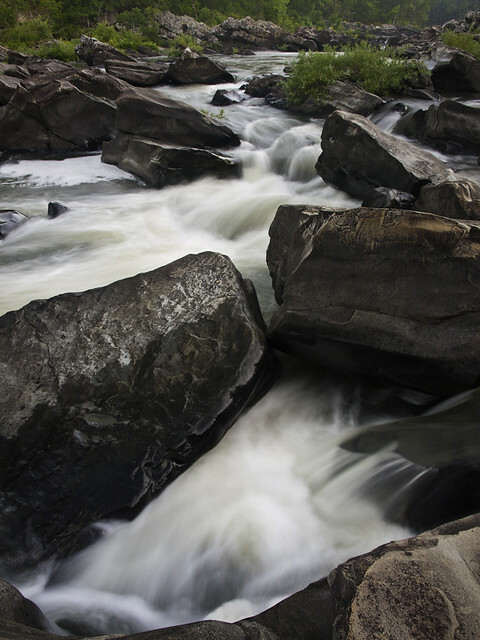 The difficulty comes from the huge boulders in the river, which helped give the river it's name. 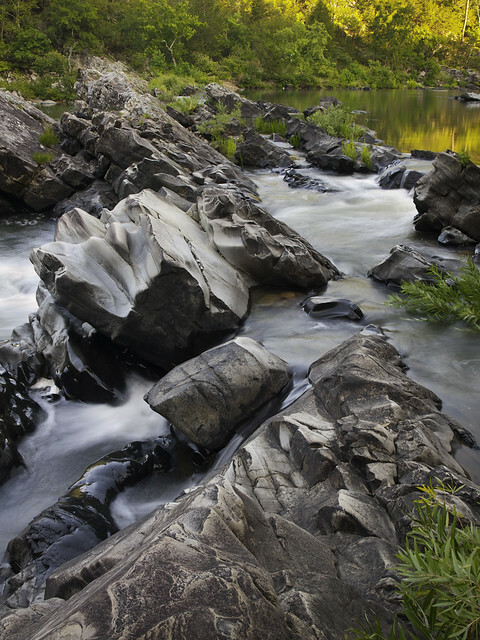 The Cossatot was named by early Native Americans, and it means "skull crusher." I moved on further down the river, and set up the camera in a neat spot (no snakes, as far as I know). 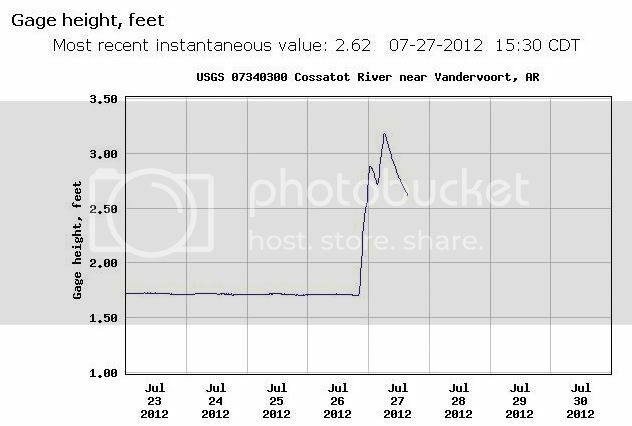 Here is a wider view of the Cossatot. 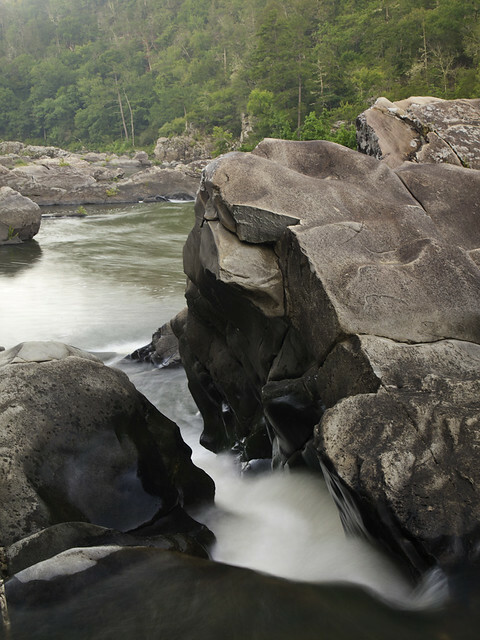 It's amazing that people can take kayaks down this, since it's more rock than river. They are much braver than I am. 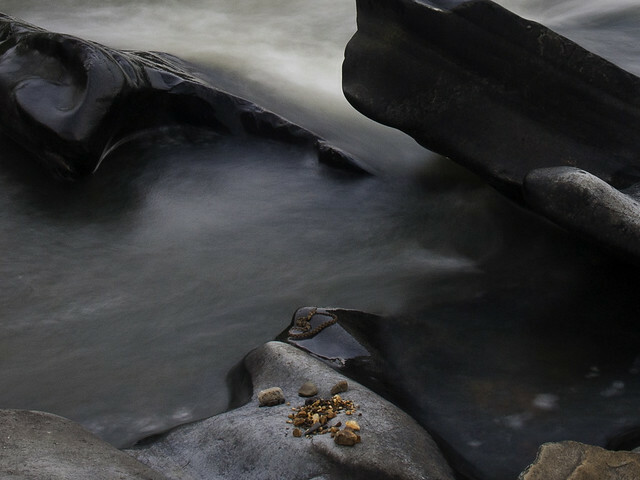 Another neat aspect of the Cossatot are the rocks that have been sculpted by the rushing waters of the river. And then the sun was nearly up, and it was the end of taking pictures on the river. So we got into the Jeep and explored a bit more of the state park. 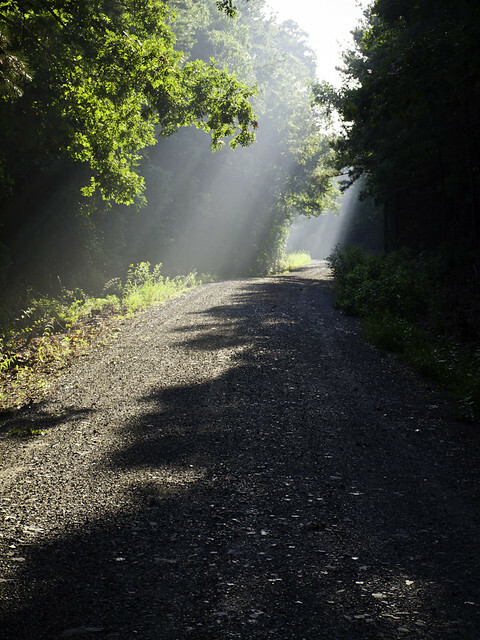 We followed this road north, while the sun cut through the trees and summer haze. 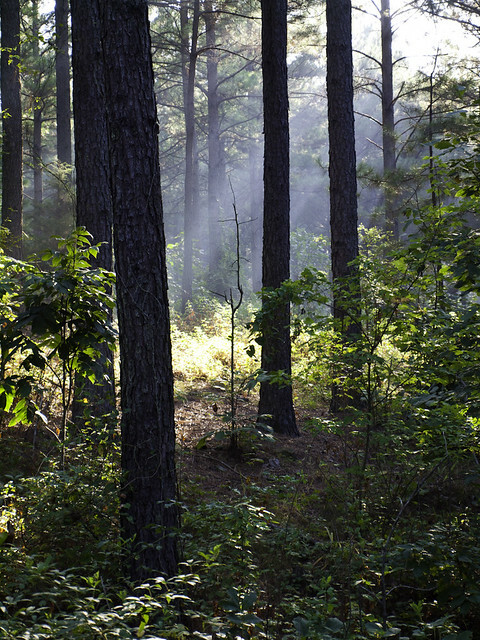 Driving further down the road, we spotted the sun breaking through the pine trees in the forest that lined the road. It was here that nature took it's revenge. As I strolled through the woods in search of pictures, I stumbled upon a nest of chiggers. So now I'm covered with a large amount of chigger bites, which are very itchy and annoying. Last week, another storm moved through the area and brought with it a nice lightning show. 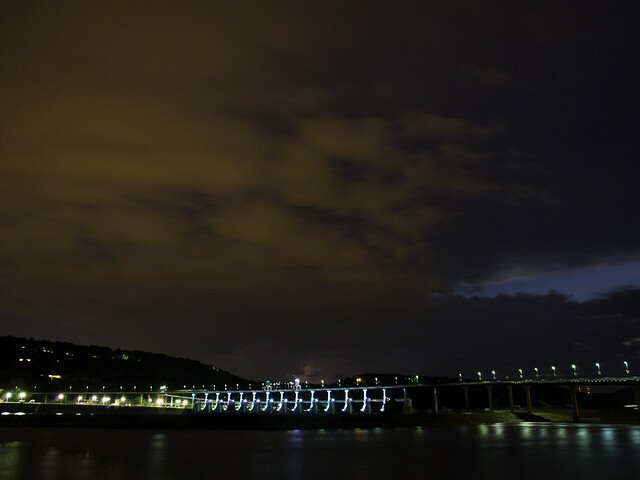 So I dutifully grabbed the camera and made another visit to the Big Dam Bridge. On the drive through the bridge I was excited to see so much lighting, and hoped that it stick around long enough for me to get a few shots. When I got to the bridge there was a lot of lightning still. But alas, a low hill along the Arkansas River blocked most of my view. Then I swung the camera around and got a few pictures of the bridge. The storm was breaking up, and the different layers of clouds were reflecting back the light in some neat ways. I think the orange is mostly a combination of lightning and city lights. A huge storm moved through town on Tuesday afternoon. It rained cats and dogs at my apartment (not literally, fortunately). The storm passed through right after I got home from work, so I only had to dodge a few raindrops. But around 5:00, it started pouring down rain. One of my co-workers wasn't as lucky and got stuck in the worst of the storm. She reported being stuck in traffic on the freeway, which was inching along at 15 mph during the worst of the heavy rain. She lives in Greenbriar, and it took her an hour and a half to get home. I thought the storm clouds would cover up the sunset that night, so I hesitated before heading out to Two Rivers Bridge that night to meet up with Zack and John. But I was glad I drove out there, since there was indeed a sunset. And it turned out to be one of the more unique sunsets that you can view from the bridge. 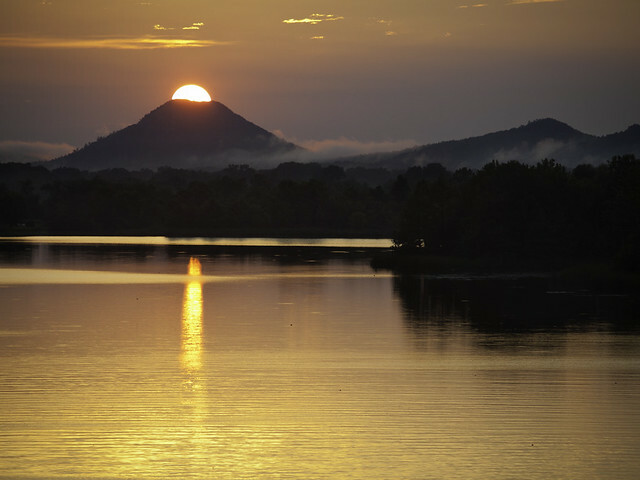 As the sun sank below Pinnacle, there were probably ten or so other people gathered along the railings of the bridge taking pictures. This has to be most people I've ever seen out taking pictures from the bridge (most people there are doing more sensible things, like exercising). The line of cameras reminded me of the throngs of people set up along the side of the road at Boxley Valley whenever the elk are out. 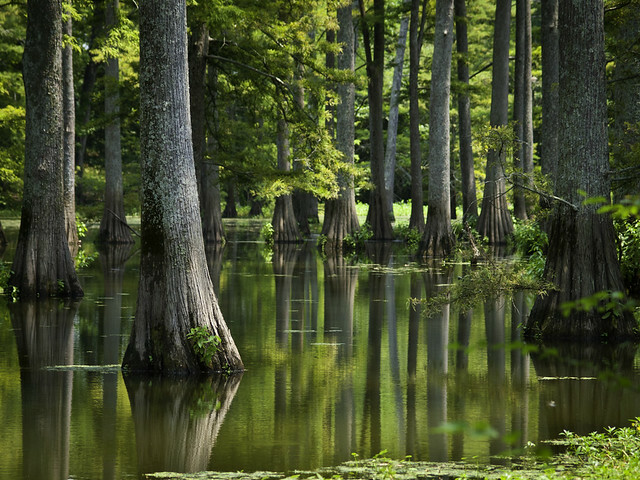 On Saturday, an old friend of mine had an idea of driving through the Delta of eastern Arkansas and do some exploring. He had the weekend free, meaning his wife and kids were out of town. Instead of doing yardwork in the summer heat, he thought it would be more fun to aimlessly drive around the state. Since it meant I got to take pictures, I was happy to oblige. We drove a bit further and saw this abandoned old church, just outside of the town of England. The church looked like it has been empty for decades. 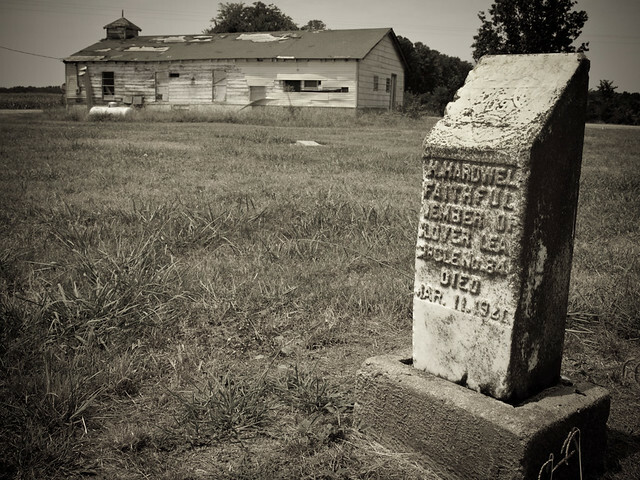 There was an old cemetery next to it, with grave markers dating back to the 1910s. I went out to take a few pictures, which I always feel a bit bad about. I don't know how I'd feel if in the future people were taking pictures of my gravestone because it looked artfully worn-down. Hopefully the people whose markers I took pictures of don't mind, and won't haunt me. The pictures look like the church is located in the middle of nowhere. But actually it was bizarrely sitting next to a golf course. Apparently the England Country Club was built right next to the cemetery and abandoned church. Seeing the forlorn old church sitting next to a fairway while people were playing golf was an odd juxtaposition. We drove into England and had a look around. 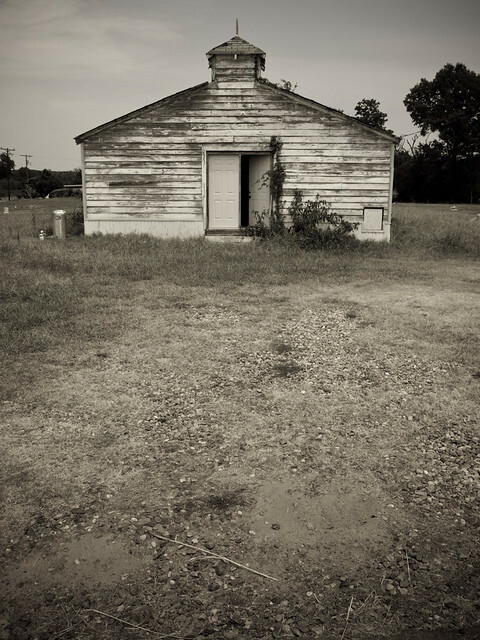 England is a small town (with a population of 2,972, which still makes it the third largest city in Lonoke County), but it makes up for it's size with a huge collection of old buildings. 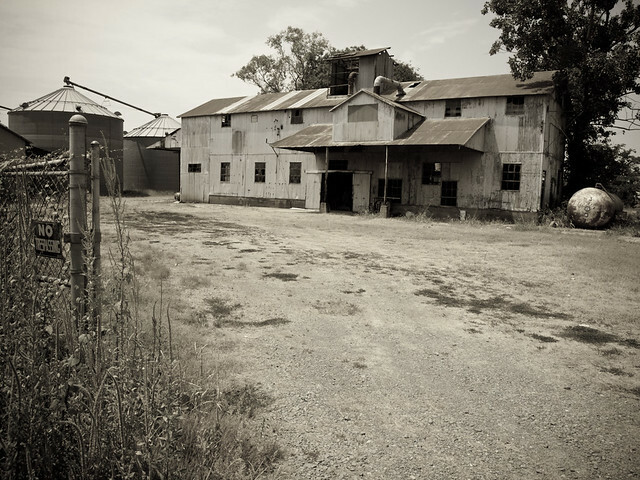 Lots of old cotton gins and other rusty structures line the roads in and out of town. From there we headed south on Hwy. 15 towards Pine Bluff. We soon passed through the small town of Tucker. The town of Tucker was named after the old Tucker plantation, which opened in 1871. The plantation is gone, but you can just barely see the old grand plantation home. 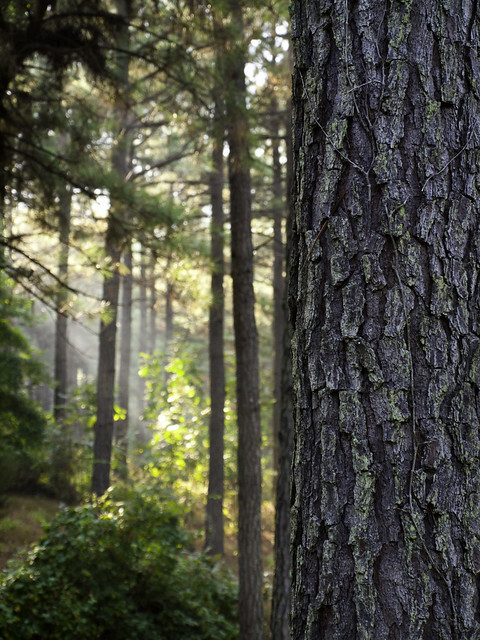 It sits abandoned and nearly surrounded by tall trees. Nowadays, Tucker is more known for the Maximum Security Prison there. On seeing the signs on the side of the road near the prison, we decided to stop for a pictures. We headed further south, crossed over the Arkansas River and drove into Pine Bluff. Pine Bluff kinda seems like the Arkansas version of Detroit. It was once the third largest city in the state, but it's been struggling recently. We drove past blocks of empty buildings in downtown and then got out and walked along Main Street in the nearly 100 degree heat. We went by the old train station (now a museum), and past empty storefronts that hadn't seen any business in awhile. This is the building that most recently housed the Band Museum, which boasted as being the largest museum in the US devoted to band music and its instruments. 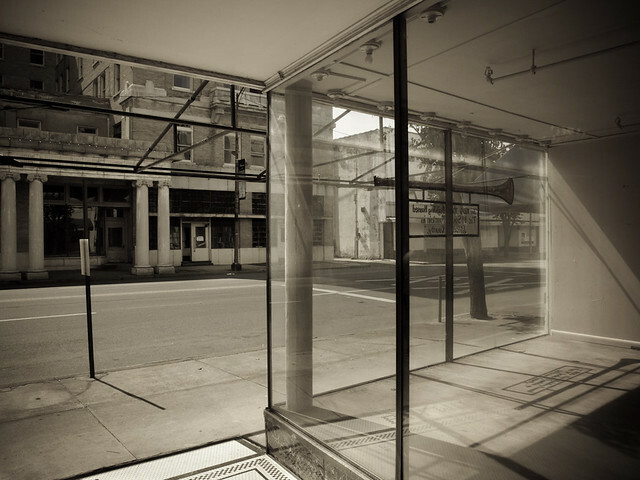 The window here has a little info on it, highlighting the fact that the first ever soda fountain in Jefferson County was in this building, dating back to the 1880s. But the soda fountain and the band museum are silent now. The museum has a website, which still sadly promotes the museum's 10th Anniversary party, scheduled for November 4, 2004. 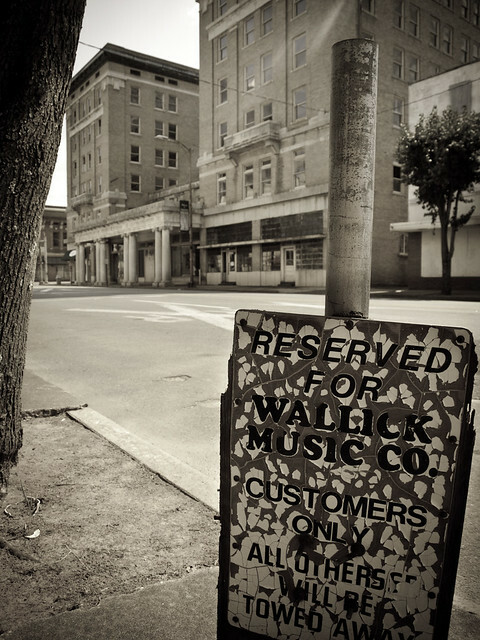 This was taken a bit further down the block, next to a music store that is still open and clinging to it's home on Main Street. I also felt a little bad while taking pictures in Pine Bluff. The city is a bit down on their luck, and I didn't want people to think I was exploiting it for pictures (even though, I guess, I did). So if anyone from Pine Bluff reads this, I hope they don't mind and won't haunt me. After that it was time to head on back home to Little Rock. We managed to make it back in time for my friend to be able to meet the family when they came back in town, and for me to get to watch the FC Dallas game that night (which was totally worth it since it ended in a thrilling 0-0 draw). 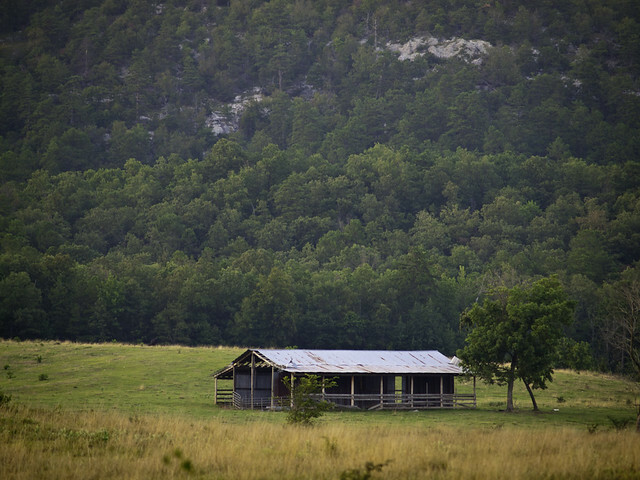 Arkansas is in the middle of a pretty severe drought right now, which has turned most of the woods into kindling. 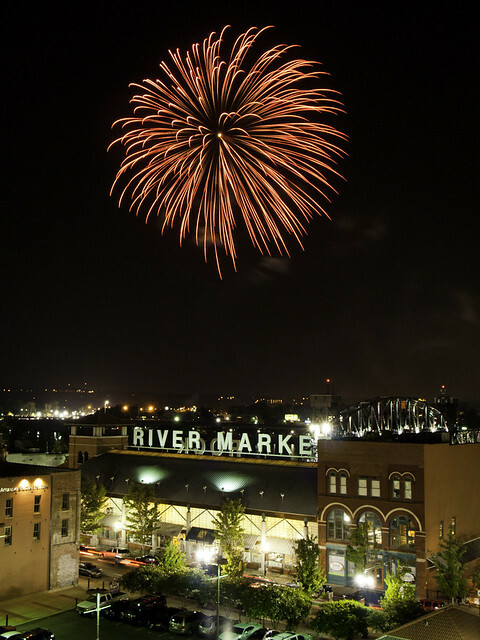 As a result of the extremely dry conditions, most of the larger fireworks displays in honor of Independence Day were cancelled across the state. But the one in downtown Little Rock was on, in spite of the 100 degree weather that day. From there, we could even hear the patriotic music from the Arkansas Symphony Orchestra performing at the Riverfront Amphitheater. But it had to compete with some random Zydeco music that was emanating from one of the bars along Clinton Avenue. Finally at 9:30, the fireworks show started. 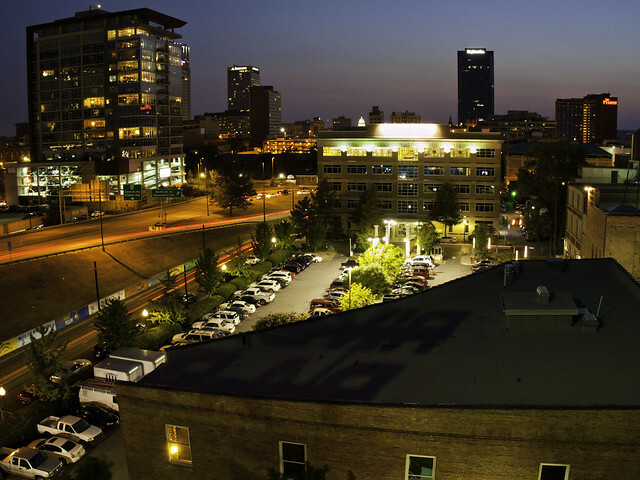 On Sunday night I drove through downtown Little Rock and tried to find something interesting to get a picture of. I eventually ended up at the old train station in town, Union Station. This is the third train station located here. The first station was built in 1885, but it burned down. And then the replacement station also caught fire and burned down. The current Union Station, which was built for the St. Louis, Iron Mountain, and Southern Railroad, was constructed in 1921. 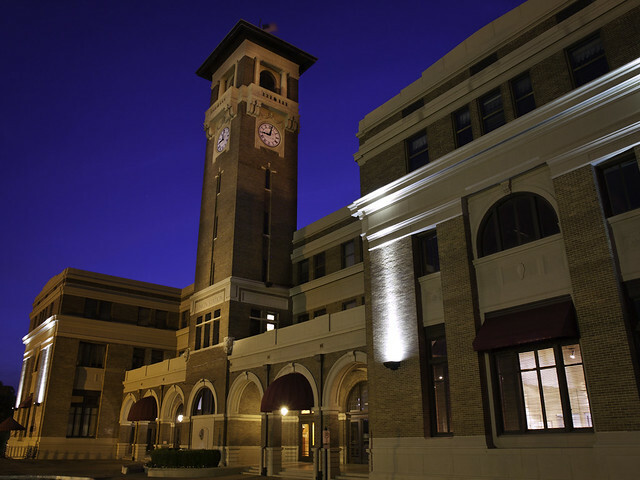 It is a neat old building, and it did have a small claim to fame in the past as being the largest train station in the country that only served one rail carrier. It still does serve one rail carrier - Amtrak. Although you have to be a night-owl to catch the train here. To travel to Dallas, the train leaves at 3:10 am. To travel to Chicago, the train heads off at 11:40 pm. The station was pretty quiet that night, since it was about 9:00 on a Sunday.